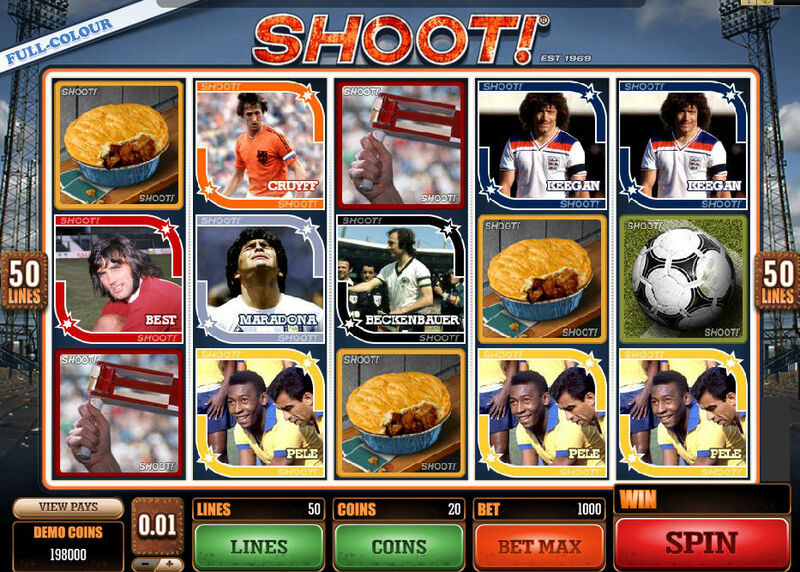 The Shoot football slot is a 50 lined slot featuring some of the greatest footballers of all time, inluding Pele, Kevin Keegan (debatable), Cruyf, Maradona and Geroge Best amongst many others! The game is based on iconic Shoot! Magazine popular amonst children and adults alike in the 60,70,80 and 90s. 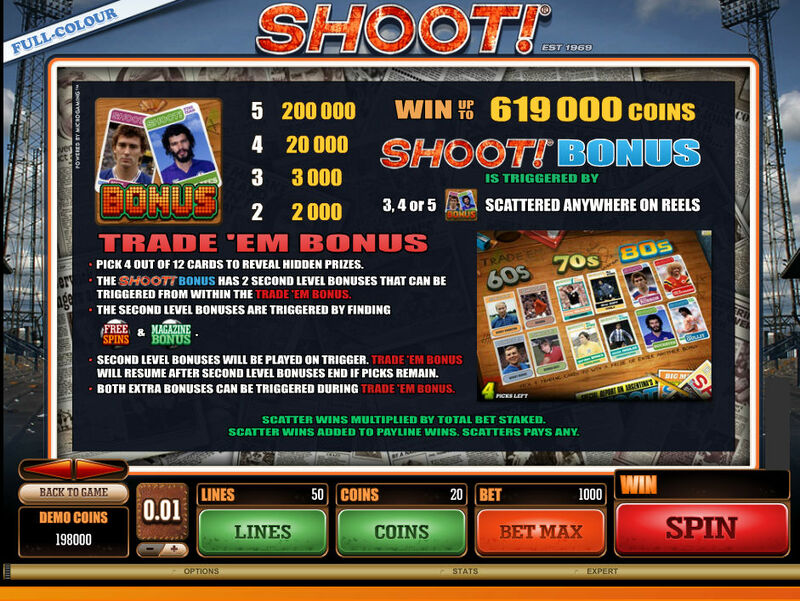 The big attraction in the Shoot Slot is a Trade ‘Em Bonus, from where 2 other bonus features can be accessed to boost your winnings! When 3 or more Bonus Scatter Symbols appear on the five reels this generous second screen feature is triggered, transporting you to a 1970’s school desk covered in 12 trading cards and awarding 4 picks to reveal generous prizes. If you get 3 or more Bonus Scatter Symbols on the 5 reels then you go to a 2nd Bonus screen where you see a school desk covered with 12 trading cards. Simply pick 4 of these to win more prizes. There are also Free Spins in the Shoot Slot, where you need to hit a spin button in front of a plastic toy scoreboard, which reveals a random number of free spins that range from 10 to 35, with all wins doubled whilst the feature is running. In addition, there is a Magazine Bonus round. Here you choose from 12 Shoot! Magazines spread across the floor until a ‘red card’ appears to end the bonus! Also watch out for the Wild and Scatter symbols which can further increase your winnings! This is the bonus round on the game Shoot.